There is something very special to most naturalists about seeing a new species. If that species is rare, then the excitement of seeing it is even greater, especially if there has been a lot of effort and planning involved. In my late teens, I had the very great good fortune of spending my Saturday mornings in the Leicester University Herbarium in the company of Professor Tutin (of the Clapham, Tutin and Warburg Flora). 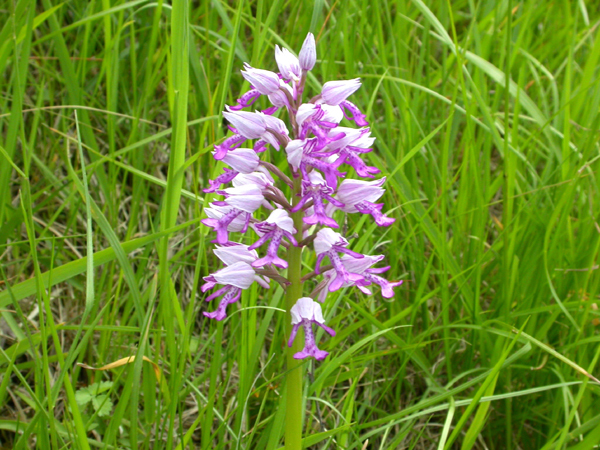 On one occasion, he let slip that the very rare Military Orchid had been found in Suffolk. He gave me rather vague instructions. At the time, I was at school about twenty miles from the site, and during its flowering season at the weekend, I would cycle over to the area. The site is to the north of a roundabout from which roads spread north like the spokes of a bicycle. I first had to try and work out which of the roads was the one Professor Tutin had been referring to. Over perhaps three years, I tried in vain to find the site and it wasn’t until I was at University that a friend who knew the exact locality took me to pay my respects. While I was at school, I was a keen plant collector, and I suspect that had I found the plant, I would have collected a spike for my herbarium; I have to say in retrospect, I am somewhat relieved that my youthful hunt did not bear fruit. Secrecy about the sites of rarities is not always a good idea. There are a large number of people who have a determination to experience the thrill of being in the company of a rare and exotic orchid. Luckily, today few botanists would want to add rare orchid specimens to their private herbaria, and most like to treasure the memory of the experience with a photograph. 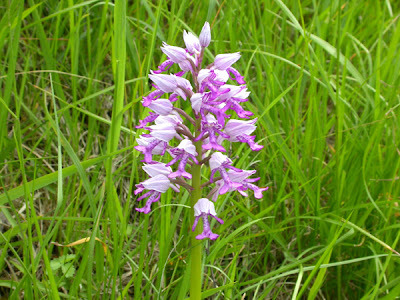 Policing of fragile sites during the flowering season, and allowing the whereabouts of such sites that can cope to be widely known can be very beneficial for keeping people involved with the natural world. The keen and fanatic orchid hunter is almost certainly going to try every possible way to track down his quarry. Many will travel vast distances to achieve that goal. How much more pleasant it would be for everyone if the site were policed, and the orchid fanatic would not have to suffer that wave of guilt that acting like some international spy would give him. Most are more than prepared to give a generous donation for the privilege of seeing, and photographing a rare orchid. It was an episode of the television series Wild Things that stimulated me to write this blog. In the programme, one of the presenters visited a wonderful clump of Lady’s Slipper Orchids that are the progeny from native wild plants. The good news that there are as many as a hundred plants in various secret sites in Britain was mentioned. Whether the plant I experienced back in the early 1970s is still extant, I was unable to confirm. 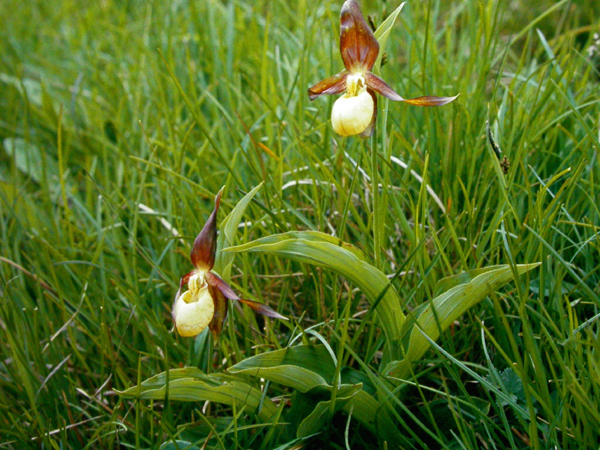 In my twenties, I was a determined orchid hunter and had replaced any remnant ideas of collecting actual plants with making a series of my own personal photographs. 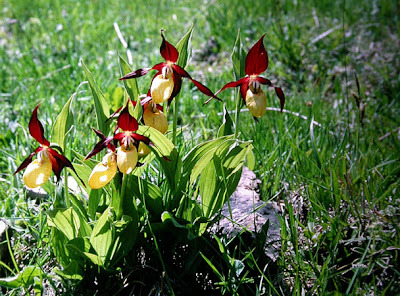 Perhaps the most mystical and prestigious species is the Lady’s Slipper Orchid. My botanical friend knew of its locality, and undertook to give me detailed instructions for finding the site, provided I never let on who it was who gave me the information. He suggested that I contact the then Nature Conservancy Council and tell them I knew where the site was, having visited it in the past, and saying that I would very much like to improve the quality of my photographs. The officer in the Nature Conservancy Council called my bluff, and suggested I meet him at the entrance to the area. “I’d like you to show me where your plants are,” he said, “After all, your site may not be the same as mine.” As it happens, the site is a good way from the nearest road, and even with my instructions, finding my way there unaided I knew would be demanding, However, I led him to within a few yards of the orchids’ but I couldn’t actually spot them. “They are around here somewhere,” I muttered somewhat feebly. In fact they really were only a few yards from where I stood, and my companion pointed them out to me. I understand that more recently than at the time of my visit, during the flowering season, a guard sat close by and was camouflaged. The guard allowed people to approach within a few yards of the plants before he actually revealed his presence. 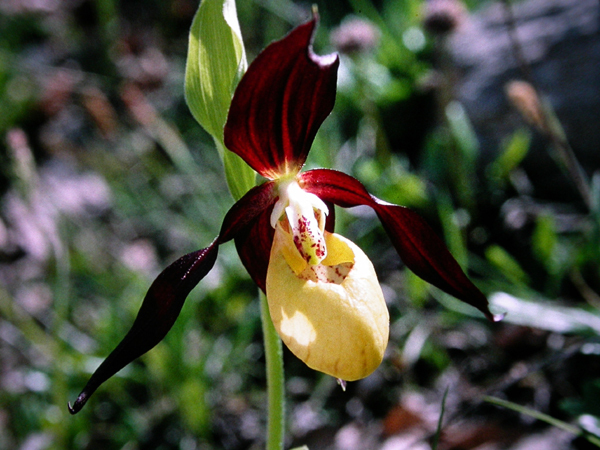 The Lady’s Slipper Orchid in Britain became an extreme rarity having suffered acutely from collection by Victorian gardeners. Luckily, some of the plants that were dug up are known to be of wild origin, and these have been used for re-introductions into the wild. Abroad the Lady’s Slipper Orchid is also far from common, however I enjoyed a rare experience when I saw a colony of perhaps a hundred plants on a hillside in the Spanish Pyrenees. It was also in early autumn in the 1970s that I began my campaign to see and photograph the Ghost Orchid. I was told of a botanist in Buckinghamshire who looked after the site, and went to visit her. She told me of the site, and approximately the best time of year to attempt to find it. The potential area is large, and the plants could appear over several acres of ground. 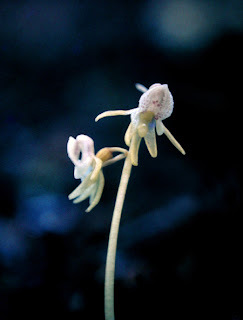 In fact, the Ghost Orchid behaves more like a fungus than a flowering plant, and has been known to produce flowers throughout much of the year. Weather conditions over a whole year seem to control when and whether it will appear. Another friend of mine said he had visited the site some twenty four times over several years without success. On the occasion of my first attempt, he was otherwise engaged. Having taken the photos, I leaned fallen branches against trees making a triangle; the plant was more or less in the centre of the triangle. I hoped that my friend would be able to find the plant from this. I knew he would be at home, so in a state of extreme elation, I left to ring him to give him the good news. On my way out, I spotted a second, equally tiny plant in a leaf filled ditch close to the road. Having made the phone call, I returned to the site to see if I could find yet more plants. As I walked through the woods, still some distance from my first plant, I became aware of a man, festooned with cameras walking parallel to me perhaps a hundred yards away. To say he was furtive would be an under-statement. Slowly, his path approached mine, and he bucked up courage to ask. “Are you looking for what I think you’re looking for?” he asked. I decided to show him the plant a good distance from the road, and hoped that he would not spot the indicating fallen branches. “I see what you mean,” he spluttered when we were still at least two hundred yards way from my plant. There in a leaf filled hollow were two magnificent plants. The larger was at least six inches tall and supported three perfect flowers. The other was a little shorter and had two. I took more photos. [When I got them back, they were better than those of my first plant.] After enjoying the plant, we very carefully used a small dead stick to try and imitate an insect to pollinate the plants. The effort required to release the pollinia was quite considerable, and it would have taken at least a bumblebee to do it. Perhaps that is one reason they are so rare. It was a week before I returned to the site. The plant we had pollinated was now a dry husk, and had obviously set seed. The dry capsule looked swollen and cracked where the seeds had escaped. From information given by several visiting botanists, it seemed that at least ten plants had appeared in that dell, and regretfully, an artist had collected one of them. My friend had indeed visited the site, and had actually found a plant whose bud was still opening beneath the layer of dead leaves. I had a further scout round, and found a plant at least half a mile away on the other side of the road. A few years later in 1978, another botanist friend came to stay. We were wondering what to do when I said. 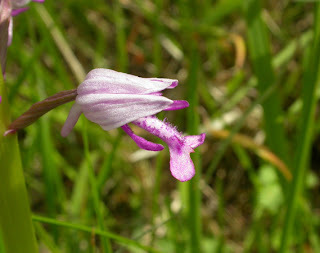 “This is a long shot, but why don’t we go and try and find the Ghost Orchid. The weather has been promising and it’s about the same time of year as when I saw it before.” We went off to the site, and this time another little plant with one flower, and perhaps just over an inch tall was being admired by a small group of enthusiasts. This may have been the last year in which it was seen. It has been a long time since flowers were last enjoyed in its comparatively well known site. I suspect, however that there may be considerable quantities of vegetative plants waiting below the surface of leaves, just waiting for the right conditions.